Tiramisu is a delicious Italian dessert layered with mascarpone and coffee-flavored ladyfingers or finger biscuits. This is a popular dessert packed with rich flavors and aromas. It is sweet, delicious, light, and elegant. Some rightfully call it the world's coolest trifle. 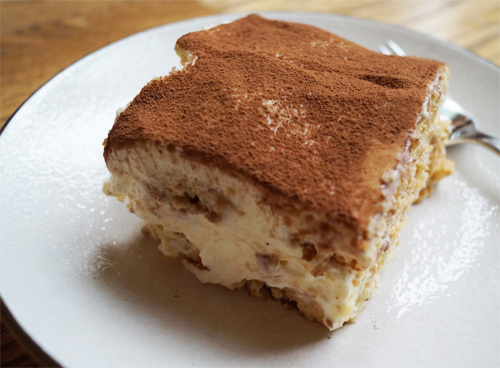 This recipe is easy to follow and make a killer tiramisu - the best treat around. Some versions use liquors such as Irish cream, Malibu, brandy, port, and dark rum, this is up to you. Make sure you stick to a low carb-friendly version. In a bowl using electric mixer beat the egg yolks with sugar substitute until creamy. Set aside. In a separate bowl beat the egg whites until fluffy and forming peaks. Add mascarpone cheese into egg yolks and beat lightly. Fold in sour cream and mix and beat lightly. Add the egg whites into the mix. Lightly and quickly dip the sugar free lady fingers into the coffee (I dip them on one side only) or alternatively when you arrange them in layers just sprinkle them with coffee. Then sprinkle the sugar free lady fingers with the alcohol of choice. Cover with a thick layer of the eggs-mascarpone mix. Then again arrange another layer of sugar free ladyfingers dipped/sprinkled with coffee and Baileys. Cover again with the mascarpone mixture. Leave it in the fridge for a couple of hours and only then sprinkle with cocoa powder. The tiramisu is best if eaten at least 5-6 hours later.